On a typical autumn morning in April 1954, newsagents across suburban Australia drove past countless thousands of texture brick and tile homes, tossing tightly rolled copies of the morning newspaper into a never-ending sea of neatly mown front yards. 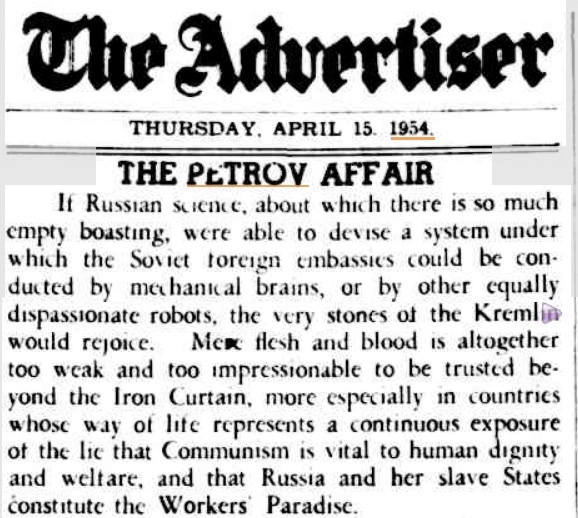 Yawning in their dressing gowns, innumerable card-carrying members of the Australian petit-bourgeoisie retrieved their Heralds, their Ages and their Advertisers and unrolled them to encounter headlines more usual in Berlin or Kiev. All of a sudden, the seediest scenarios – secret agents and double agents, betrayal and despair, liquor, women, intrigue, ASIO, the KGB – were all on offer, to be ingested with the cornflakes, but right here and now, not far away and over there. That particular atmosphere, that gripping implausible moment in time and place, is captured and explored in caressing, intricate detail by our latest Pitt Street Poetry offering – The Petrov Poems – a verse novel by Canberra poet Lesley Lebkowicz. when he met her. The arrest of Krivosh makes her a risk. But an invisible cord wound him into her world. patting her hands with a tea towel. What are you doing? In answer he holds out the paper. Anything we should know? until she sighs, I’m going to bed. He won’t mention defection again. He’ll go without telling her. He’ll take nothing that could implicate her. The Petrov Poems offers something entirely different from the average run of local Oz poetry collections. It combines the tension and narrative drive of an early John le Carré novel with the human insights of a Rosemary Dobson and the nuanced political complexity of a late David Marr monograph. Its layers of meaning repay reading and re-reading. These days the newsagent’s morning pilgrimage is usurped as a source of headlines by a dawn chorus of solipsistic bloggers, twitterers and soi-disant Canberra insiders. Yet the great dramatic political set-pieces remain few and far between. The Petrov Affair is one such, and amply deserves its celebration and deconstruction in this unforgettable new verse novel. 2013 started quietly enough for Pitt Street Poetry, after a longish summer break. But now as the days shorten, events and projects are crowding in. During autumn (and on into winter) we can look forward to four book launches and a newly signed poet reading her work on the ABC radio program Poetica. Our first book for the year is a reissue of Luke Davies’ first poetry book Four Plots for Magnets. Originally published when Davies was just 20 years old by poet S. K. Kelen at the romantically named Glandular Press in Sydney in 1982, this youthful jeux d’esprit started life as a slim stapled pamphlet of 13 poems. There is a sense of heady intoxication in the verse – with Sydney, with love, with life, with afternoon television – and not infrequently with intoxication as an end in itself. Now aged 50, Davies offers these poems to his devoted readers once again as an opportunity to share a cheerful reunion with long-lost, slightly wayward children who have stubbornly refused to grow up. In a long, wry, self-deprecating foreword, illustrated with snapshots from his own collection, he tells the story of how the book came to be and what it was like to be a young poet in Sydney in the early 80s. Searching back through his files, Davies has found 53 additional previously uncollected poems written in the same two year period at the beginning of the decade. There are eight pages of notes on the poems, some scholarly enough, some more mischievous glosses on the various contemporary allusions which pepper the book. The original publisher, poet S. K. Kelen, rounds out the publication with a reflective afterword, charting Davies’ course since those early days and making the link between the poems in Four Plots and those of his maturity in books such as the recent Interferon Psalms, which won the inaugural Prime Minister’s Literary Award for Poetry in 2012. Four Plots for Magnets will be launched in Melbourne by distinguished poet and literary academic Grant Caldwell on Wednesday 15th May at 5.30pm at the Wheeler Centre in Little Lonsdale Street. All are welcome and drinks will be served. In Sydney the launch of Four Plots for Magnets will take place as part of the Sydney Writers Festival at the Brett Whiteley Studio at 2 Raper St, Surry Hills on Sunday 26th May at 2pm. Festival international guest Irish poet Dermot Healy will launch the book. This will be a double launch with Michael Brennan’s new poetry collection Autoethnographic from Giramondo – recently awarded the Grace Leven prize – to be launched by David Malouf. This event is free to attend but bookings are essential and can be made by sending an email to the Brett Whiteley Studio poetry event series curator Angela Stretch at sydneypoetry-2@angelastretch.com. During the course of the year we plan to feature each new poetry book in some detail in this blog as the time for publication approaches. Meanwhile, by way of a brief heads up, Canberrans can mark in their diary the advent of a new verse novel by local poet Lesley Lebkowicz, with images by Sydney artist Dean Brown. The Petrov Poems explores the gripping story of Australia’s most notorious spy scandal. It will be launched by Canberra poet John Foulcher at Paperchain Bookshop in Manuka, ACT on Thursday 27th June at 6pm. And to round out the quartet of launches, Ron Pretty’s new book for Pitt Street Poetry What the Afternoon Knows, the product of a recent Australia Council residency in Rome, will launch in mid-July. More details Real Soon Now. Finally, let us close this May missive with a warm welcome to the newest member of the Pitt Street Poetry family: Melinda Smith, whose latest poetry collection – provisionally titled Drag down to unlock or place an emergency call – will be published by Pitt Street Poetry in the spring. You can enjoy a sneak preview when Melinda reads her poem ‘Roadside memorials’ on the ABC’s weekly poetry radio program Poetica on Saturday 11th May at 3pm as part of a broad-ranging examination of the use of the villanelle in contemporary Australian poetry. Jean Kent discussed the State of Poetry in Australia with David Musgrave, Anna Kerdijk Nicholson, and Philip Salom. We’re gearing up for the launch of Jean Kent’s new peripatetic poetry collection Travelling with the Wrong Phrasebooks at the Toronto Library in Lake Macquarie on Sat 29th September. Check out the Facebook event for more details if you’d like to join us. Well known Sydney poet savant Judith Beveridge will be there to crack the metaphorical bottle of bubbly over the metaphorical bows. Paul reviewed the illustrated hardback version and so also has some kind comments for artist Oliver Watts and even for Pitt Street Poetry itself. Thanks Paul. The Queensland Poetry Festival – held at the Judith Wright Centre in Fortitude Valley in Brisbane last weekend – invited Jean Kent to join the raft of national and international poets featured on the festival roster. Jean read from her new collection Travelling with the Wrong Phrasebooks on Saturday and again on Sunday. The books themselves arrived from the printers just in time, and the festival bookstore did a brisk trade in both the hard back and paperback versions. Each of which, by the way, are now available for purchase on-line from our friendly, easy to use Emporium.